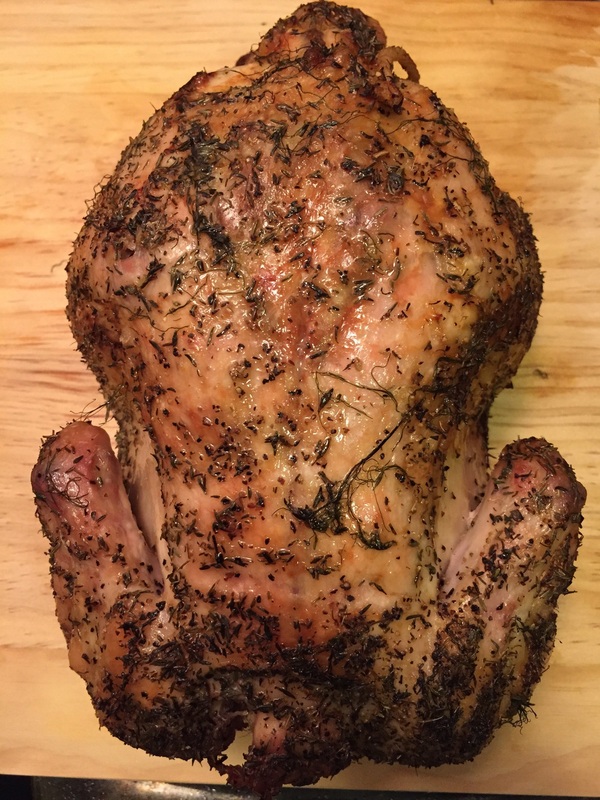 This was my first time roasting a chicken! I'm excited with the way it came out, recipe below! Dice the fennel & smash 4 of the cloves of garlic. Slice the lemon. Set aside. Mix 1 tablespoon of butter with the lemon zest, & add the remaining garlic clove, minced. Rub outside the whole chicken with the lemon slices. Stuff inside the cavity with the diced fennel, smashed garlic cloves & lemon slices. Add the remaining tablespoon of butter inside. Use a piece of cooking string to tie the legs together, and the wings if needed. Place your fingers under the skin of the chicken, pull up gently so there's a gap between the skin & the flesh. Start adding chunks of the butter mixture & press it down so it's evenly coated under the skin. Turn the chicken over & do the same to the other side of skin. Sprinkle the salt & pepper on both sides, then the dry thyme & fresh fennel leaves. Coat with olive oil on the top. Roast on 400 degrees F for 1 hour, then turn it over & roast for another 30 mins. So that the skin on top of the chicken is crispy, turn the oven off & flip the chicken over, putting it back in the oven for 5 mins. I ate this with my homemade mustard sauce - it was delish! Just take 2 tablespoons of sour cream, add in 1 tablespoon of spicy mustard & 1 teaspoon honey. Mix & enjoy!